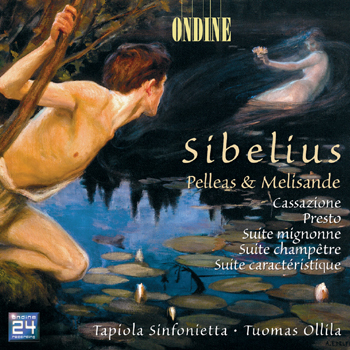 This CD contains works by Jean Sibelius worthy of discovery: The concert version of his incidental music to the symbolist play Pelléas et Mélisande by Maurice Maeterlinck (cor anglais solo: Marja Talka) is coupled with less-known orchestral works, three minor suites from the early 1920s, Presto for strings (arrangement of the third movement of the String Quartet Op. 4) and Cassazione. The recordings were made at the Tapiola Hall in Espoo in February 2000, featuring Tuomas Ollila and the Tapiola Sinfonietta of which he has been a regular conductor.